The Federal election campaign has been running for, well, a whole campaign now and some strange things have been happening on the road to Ottawa. Ahmed Hussen was the surprise nomination of the York South-Weston Liberals back in December last year. 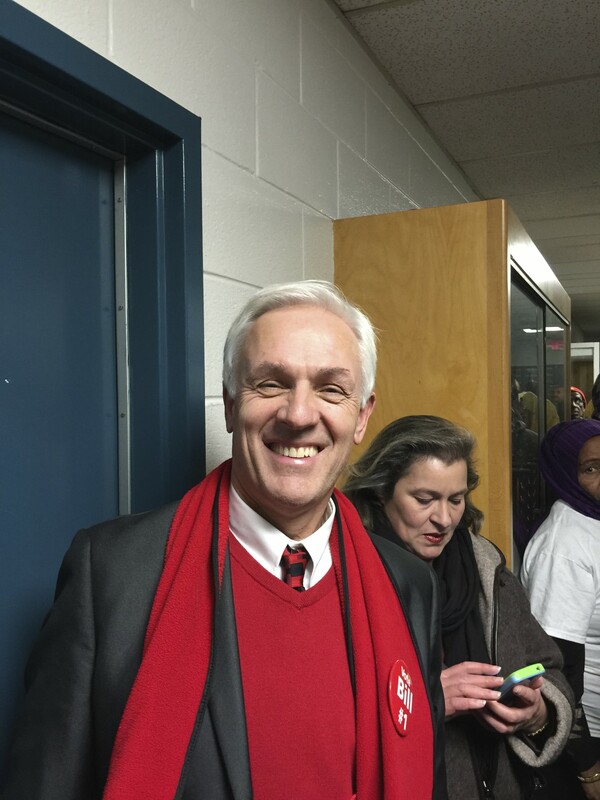 Many had expected YSW Liberal Riding executive Jules Kerlinger to be a nominee but he inexplicably withdrew from the race quite early and wouldn’t talk about it. Rumours were that he’d been invited to step aside by the Liberal Party but confirming those rumours proved elusive. Riding Association President, Ryan Ward was unable or unwilling to open up on the subject, referring me to Ottawa functionaries. Jules himself declined to respond. Former Toronto councillor Bill Saundercook was then expected to get the nod but during the voting process, a strange turn of events took place. Large numbers of people came by the busload to vote and somehow, a bottleneck occurred at the membership and credential checking process. Late in the afternoon, with time pressing, organizers decided to close the polls before everyone was able to reach the voting booths. Outsiders shrugged and thought that this was simply business as usual for the Liberals. Bill Saundercook confidently awaits the result at the nomination meeting. The result of the vote that fateful day was a shock, not merely because a seeming long-shot had won but also because of the surprisingly small number of votes cast when compared to the huge numbers lined up – no doubt a result of the glacial pace of the voting line. The winner was a relative unknown, Ahmed Hussen but he had a well known local backer, George Smitherman. As 2015 progressed, Mr. Hussen was seen at various events in York South-Weston and it was thought that his campaign was shaping up nicely. With a good tail wind from Justin Trudeau, he had a reasonable chance of winning the seat. 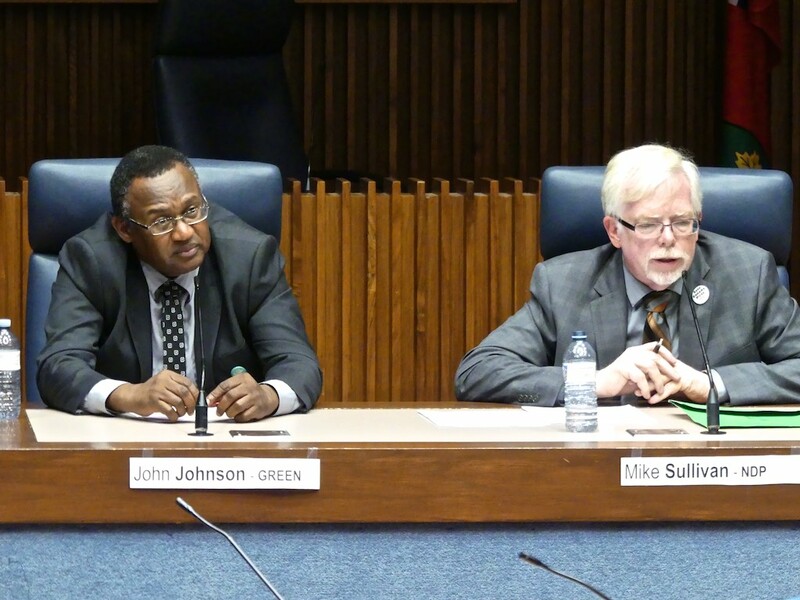 John Johnson (Green) and Mike Sullivan (NDP) tackle the issues. 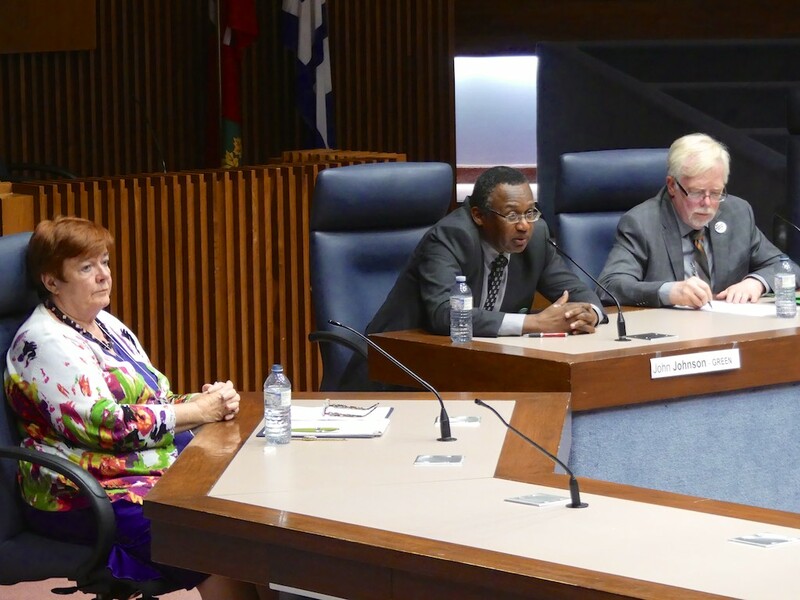 There is usually one major debate in York South-Weston before an election. This is meticulously organized by an army of hard-working volunteers from one or more organizations in the riding who do what is necessary to hold a fair debate. Many of these people are politically active but not exclusively for any one party. 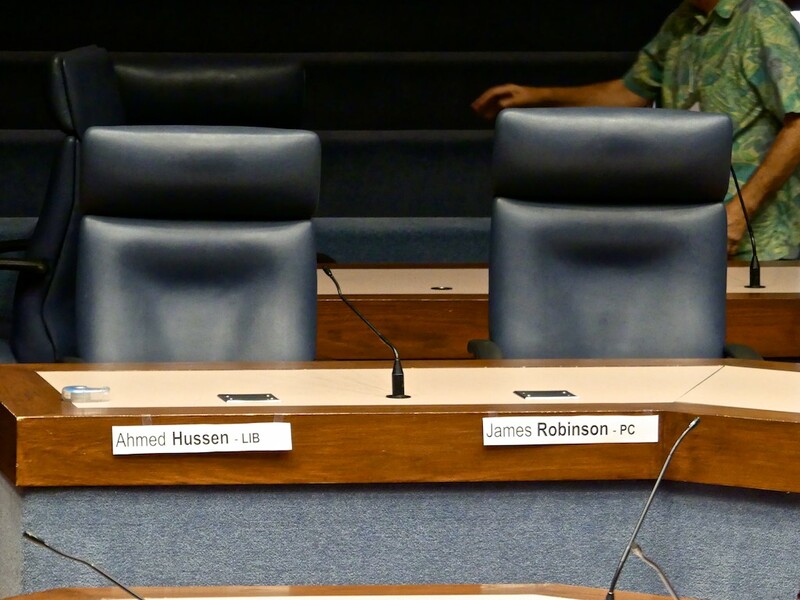 On September 16, Mr. Hussen announced to organizers that he would not attend the debate. More recently, the candidate allegedly let it be known that he considered the debate to be partisan; skewed in favour of the NDP. Moderator Judith Hayes listens to the candidates. Knowing the scrupulous lengths to which organizers of these events go makes it clear that no party owns or controls these debates. To make the allegation even more fatuous, Liberal riding executive Jules Kerlinger was part of the proceedings and read audience questions to the candidates. Witnessing the event were former YSW Liberal MP, Alan Tonks and Liberal MPP Laura Albanese who would have quite correctly blown the whistle had anything underhanded been transpiring. Jules Kerlinger reads audience questions at last night’s debate. At this stage it should be mentioned that the Conservative Party candidate also failed to show up at the debate. This was neither a surprise nor much of a disappointment as it seems to be Party policy, especially in York South-Weston where the right-wing vote along with Tory candidates’ speaking skills are generally on the marginal side. One can only surmise that Mr Hussen’s sudden attack of shyness was not from a fear of entering some sort of NDP stronghold where he would be ambushed by frothing hordes of rabid lefties. The only conclusion that the public can come to is that he was woefully unprepared to respond to audience questions and decided to bolt. That alone is telling. So much for the Big Red Wave. Thanks to Mr. Hussen, its now likely to be a trickle in this riding and YSW federal Liberals are facing four more years in the political wilderness. Perhaps the geniuses at Party HQ should have gone with Mr. Kerlinger after all. Author Roy MurrayPosted on September 29, 2015 Categories Federal Election, Mount Dennis, News, Opinion, PoliticsTags Conservative Party of Canada, Green Party, Liberal Party of Canada, Mike Sullivan, Mount Dennis, New Democratic Party, weston, York South–Weston5 Comments on Hussen blows it. Election Results: The 20% Solution. With no word from Alan Tonks about his stunning defeat, regular folks and political insiders are buzzing about Mike Sullivan’s upset victory in York South-Weston. Sometimes statistics can provide an insight into what happened. The voter turnout this time was 51% which is well below the average of around 61% for the country. In 2008 it was 50.4%. Why is our voter turnout so low? Who knows; maybe non-voters feel disconnected from the process or perhaps they feel that it doesn’t matter who wins. Either way, democracy is not well served when half of eligible voters decide that it is a waste of time to vote. The winning candidate won by a comfortable margin yet received 14,119 votes – that’s only 20.4% of the riding’s 68,978 eligible voters. Think about it; 20% of voters decided the result. In municipal elections, voter turnout is even lower – only 40% bothered to vote in Ward 11 last time. A determined candidate needed to marshal less than 20% of the vote this time—Mike Sullivan was that candidate. Without taking away from Mike Sullivan’s message and excellent campaign, this should be a warning to all politicians who feel that they own a safe seat. The fact is that where voter turnout is traditionally low, a candidate with credibility and determination can overcome even the most comfortable of incumbents. On Monday, May 2, democracy is calling. Voters have a realistic choice between incumbent Alan Tonks (Liberal) and longtime resident Mike Sullivan (NDP). Conservative candidate Jilian Saweczko has played a peek-a-boo campaign – if anyone has seen her please would you let us know? The Green’s Sonny Day struck us as a true gentleman but is very inexperienced and will need some time to learn the ways of politics. Career politician Alan Tonks, has been the Liberal member for York South-Weston since 2000: half of that time as a government MP and half in opposition. In all that time, there has been no great achievement on which he can stake a claim. In fact, since 2000, York South-Weston has continued its steady decline. While his style is congenial and he is by all accounts well-liked in Ottawa, as has been pointed out in WestonWeb, Mr Tonks is the Liberal who voted with the Tories more than all but one of his colleagues. Tellingly, Mr Tonks no longer resides in his own riding. Mike Sullivan has worked hard to bring improvements to Weston and was the NDP candidate in the 2008 election. For the past seven years he has worked to bring some transparency and accountability to the Air Rail Link project and has battled to make it an asset to Weston rather than a source of noise and disruption. As head of the grassroots Clean Train Coalition, he applied pressure (with some success) to electrify and/or cover the line so that Weston residents would not be subjected to the noise and pollution of diesel locomotives. It was through such activism that the Air Rail Link was pressured into stopping in Weston rather than barreling straight through. We need continued advocacy to ensure electrification now, not at some future date as well as minimizing disruption to residents. He is also working to bring jobs to the empty Kodak site. Sullivan is intelligent, articulate and well-informed. As a Weston resident of two decades’ standing, he knows the issues. We need a strong, knowledgeable, well-spoken advocate for Weston with a proven record of getting things done. Alan Tonks’ would be a great MP for Rosedale where everything is going swimmingly, but Weston is in dire straits and we need someone who can advocate with knowledge, passion, intelligence and forcefulness. The fact that Mike Sullivan is a long-time resident is another plus. WestonWeb’s endorsement therefore goes to Mike Sullivan. Google the phrase ‘Conservative candidates missing from debates 2011’ and you will find a veritable treasure trove of Tory candidates skipping out on debates. Here in York South Weston, Conservative candidate Jilian Saweczko, running against Sonny Day, Mike Sullivan and Alan Tonks has missed the two held so far. Either this is a brazen contempt for voters or an attempt to hide an embarrassing ineptitude at public speaking – neither of which is the hallmark of a suitable candidate. Perhaps Conservative candidates are taking a page from the playbook of Julian Fantino who, despite a similar absence from all debates, managed to squeak into first place in a by-election held in Vaughan last year. This year, he continues to absent himself hoping to repeat his good fortune. These two are not alone. All over the country, a disturbing number of Conservative candidates are unwilling to face the people and answer questions. In the end, it is up to voters to judge the meaning of all this but as the old saying goes; Fool me once shame on you; fool me twice, shame on me. The all-candidates debate for Federal election candidates was held at the Mount Dennis Legion on Wednesday, April 13th. The event was well organized and attended with a well-structured questioning process which allowed both neighbourhood organizations and individuals a chance to address the candidates. An air of respect and courtesy was evident throughout the evening due mainly to the comportment of the candidates who answered questions without resorting to negativity, and the audience’s interest in listening to the candidates. It was evident that everyone was there to exchange and receive information rather than engage in the discussion of preconceived ideas. The Mount Dennis Legion should be congratulated for their contribution to the democratic process by hosting this event. Unfortunately there was one negative aspect to the evening; the non-participation of the Conservative candidate who apparently had a more pressing engagement which prevented her from meeting with ordinary voters and responding to uncensored questions. Her empty chair stood as a testament to the discomfort the Conservatives seem to have with Toronto. No doubt voters will return the favour at the ballot box. The other candidates showed an interest in helping Weston area residents and a knowledge of our needs. All three as stated above presented a professional attitude. Of the three, Sonny Day (Green Party), Mike Sullivan (New Democratic Party) and Alan Tonks (Liberal), Sonny came across as a genuinely nice man who demonstrated a generosity of spirit when he praised the good work Mike Sullivan has done for Weston. Mike came across as well prepared, confident, professional and articulate. Many of his answers met with the approval of the audience. Alan Tonks as the elder statesman of the group was suave and well-spoken. Unfortunately, he has developed and perfected the career politician’s habit of restructuring questions while answering them, thereby never really addressing questioners’ concerns. As a non-resident, he suffers in comparison to the other two candidates. Hopefully Weston has matured beyond the need to be represented by gentleman candidates who claim to know our concerns better than we do. It might be time to be represented by one of our own. Each of the candidates had winning moments, the best was Sonny’s answer to a question about Harper’s proposed purchase of jet fighters designed for aircraft carriers (Canada has none). He won loud applause when he stated that Canada needs to purchase military equipment that meets Canada’s needs; ‘We are not a northern branch of the U.S. Air Force’. Mike Sullivan had a lot of solid ideas on how to improve the Weston area and received loud applause many times throughout the evening. He stated that the proposed airport express should be an above ground subway line serving all of the communities along the line. This would be a good step towards bringing Toronto’s transportation system in line with other world cities which are extensively served by rapid public transit. Alan’s major good point was that he claims to be working to bring a campus of George Brown College to Weston, a great way to stimulate the Weston economy. Overall, all three candidates did well but if one were to pick a winner it would have to be Mike Sullivan who presented clear answers and was able to point out some of Alan Tonks’ worse decisions as a Member of Parliament. As an experienced advocate for the Weston area, he is the most closely tied to the community and its improvement. Tonks came across as smooth and professional which is fine if Weston is happy with the status quo and sees no need for improvement. 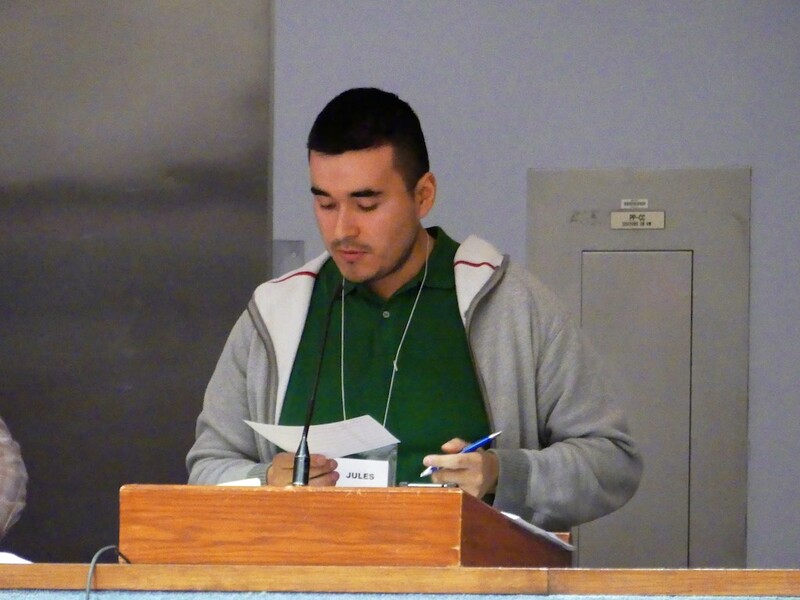 Sonny Day is well-intentioned and would certainly be a breath of fresh air in Ottawa.